It's getting colder by the day and the ponds are freezing. To some this is very exciting. The men in this household find this as exciting as casting on a new knitting project!! Yes, that exciting! I am thankful for hobbies no matter how crazy, and we support each other even when we don't understand each other! Proof! I go freeze ice fishing and Kev stocks Yarn shelves & labels skeins. [gallery type="rectangular" link="none" columns="4" ids="6942,6943,6944"] I was fortunate enough to be the recipient of these very lovely knit mittens in our Christmas Yankee Swap this year! They are keeping me toasty on these freezing cold days! Mittens - Canal in DK & Snow flake in Sport Weight Dockside Colorway Our sister Betsy (our Nice & Knit Knitter Extraordinaire) knit a few of these Mount Airy Mittens a free and fabulous pattern by O~Wool. Betsy knit several pair in Nice and Knit Yarns and they are all quite stunning. [gallery type="rectangular" link="none" ids="6936,6938"] [gallery type="rectangular" link="none" ids="6941,6940,6939"] Driftwood & High Tide Colorway What do you think of a hat or mitten knit along to pass these cold days away? Which do you prefer? I vote for a hat KAL. I had to send my former winter coat in for warranty work where it was replaced rather than repaired. The new coat is a different color and thus I have no coordinating hat for it—yet. I was gifted the yarn, I just need to stop trolling Ravelry for hat patterns and just pick one! I’m feeling a good mitten KAL. 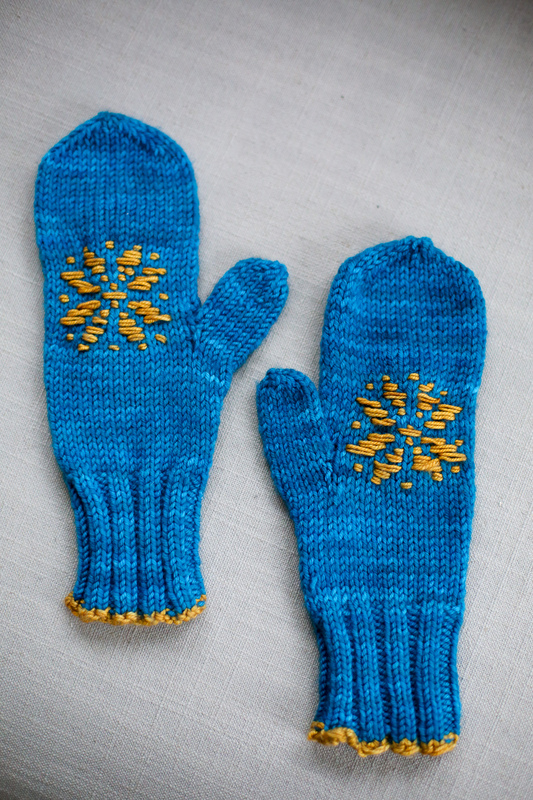 ooh, those mittens are soooo pretty! I love the embroidered snowflakes. Hat and/or mittens?! Yes! Either way I am crossing off my “To Knit in 2015”!